in the background you can see the HARPOON SSM launchers. 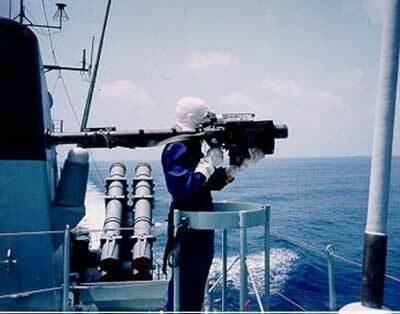 When the corvette OLFERT FISCHER was stationed in the Persian Gulf 1990-1991, she was fitted with Stinger missiles, the missiles were leased from The Royal Dutch Navy. Afterwards it was decided to acquire the system for close-in air defense for several naval unit.